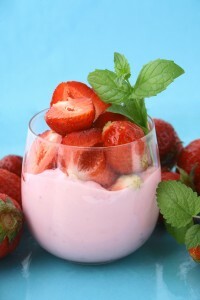 Yoghurt is a highly healthy dairy food product. It provides a number of health benefits. Most importantly, it can be used in a number of homemade recipes to produce some great tasting dishes. 1 cup plain whole milk Greek yoghurt. Add sugar, strawberries, rum, lemon juice, lemon zest to a bowl and toss. Cover the bowl with plastic wrap and leave for an hour to let the strawberries macerate. Later crush the berries in a food processor and add yoghurt and vanilla beans. Blend until smooth and let it chill for an hour. Pour the chilled yoghurt mixture into the already cooled ice cream machine and churn till the mixture turns slushy for 12 to 15 minutes. Freeze the mixture and serve cold. For the apple compote, you need 6 cups Granny Smith apples, 1 teaspoon vanilla extract, ¼ cup brown sugar, ¼ teaspoon ground cinnamon, ¼ cup water and a pinch of salt and let the mixture simmer. Heat the milk in a pan with the temperatures reaching 185 degrees F, on a medium-low heat. Once the milk steams and the heat has been turned off, whisk in the dry milk into it. If you are using maple syrup, whisk it in. Keep the mixture aside for 20 to 30 minutes and allow it to cool to a temperature of 110 degrees F. Whisk the plain yoghurt. Pour the mixture into a large glass bowl or jar and cover with a plastic wrap or kitchen towel with a few holes. Set the mixture in a place where the temperature is between 95 and 105 degrees F for 12 to 18 hours. Once set, transfer the yoghurt to the refrigerator and allow it to chill. Serve chilled after stirring.